Photo by Dr. Jacob Mathew, Malankara World with assistance from Adv. Benoy Abraham Erali, Retired Director of Prosecutorial Services, Kerala. Here's the most surprising thing in this story: When the tangible proof is right there in front of him, Thomas stuffs his hands in his pockets. Could it be he no longer needs it? Instead, he falls at Jesus' feet and cries, "My Lord and my God!" (John 20:28) It's one of the clearest confessions of Jesus' identity in the gospels. 12. Do You Celebrate These 6 Freedoms on Independence Day? On July 3rd we remember Apostle St. Thomas, The Guardian Apostle of Malankara. So, this issue of Malankara World Journal features several articles on St. Thomas. July 4th is the Independence Day in the United States. This Sunday is the 6th Sunday following the Pentecost in the church. We recall the miracle of the multiplication of the loaves in the Gospel Reading this Sunday. Due to the confluence of these three important events, we will not have any general articles in this week. The Journal will return the regular format with the next issue. We wish everyone in North America a Happy Independence Day. "In the Gospel we have just heard (Matthew 14:15-21), there is an expression of Jesus that always strikes me: 'Give them some food yourselves'. … who are the ones whom we should feed? … the crowd, the multitude. Jesus is in the midst of the people. He welcomes them; talks to them; heals them. He shows them God's mercy. In their midst, He chooses the twelve Apostles to be with him and, like him, to immerse themselves in the concrete situations of the world. The people follow him and listen to him because Jesus speaks and acts in a new way, with the authority of someone who is authentic and consistent; someone who speaks and acts truthfully; someone who gives the hope that comes from God; one who is revelation of the face of the God who is love. And the people joyfully bless God." "This evening we are that crowd in the Gospel. We also strive to follow Jesus to listen to him, to enter into communion with him in the Eucharist, to accompany him, so that He might accompany us. Let us ask ourselves: how do I follow Jesus? Jesus speaks in silence, in the Mystery of the Eucharist, and every time He reminds us that following him means going out of ourselves and making our lives not our possession, but a gift to him and to others." "The invitation that Jesus extends to his disciples to feed the multitude themselves is born of two elements: most of all from the crowd that, having followed Jesus, now finds itself outside, far from inhabited areas, as evening falls, and then, from the disciples' concern, who asked Jesus to dismiss the crowd so that they might seek food and lodging in the nearby towns. Faced with the crowd's needs, the disciples' solution is for everyone to take care of themselves. … How many times do we Christians have this temptation! We do not care for the needs of others, dismissing them with a pitiful, 'May God help you'. … But Jesus' solution goes in another direction … He asks the disciples to seat the people in communities of fifty persons. He raises his eyes to heaven, recites the blessing, breaks the loaves, and gives them to the disciples to distribute." "It is a moment of profound communion. The crowd, whose thirst has been quenched by the word of the Lord, is now nourished by his bread of life. … This evening, we too are gathered around the Lord's table … It is in listening to his Word, in nourishing ourselves with his Body and his Blood, that He makes us transforms us from a multitude into a community, from anonymity to communion. The Eucharist is the sacrament of communion, which brings us out from our selfishness to live together our journey in his footsteps, our faith in him. We all ought, therefore, to ask ourselves before the Lord: How do I live the Eucharist? Do I live it anonymously or as a moment of true communion with the Lord and also with the many brothers and sisters who share this same table?" The multiplication of the loaves [is born of] Jesus' invitation to his disciples: 'Feed them yourselves', 'give', share. What do the disciples share? What little they have: five loaves and two fishes. But it is precisely those loaves and fishes that, in God's hands, feed the whole crowd. And it is precisely the disciples, bewildered by the inability of their means, by the poverty of what they have at their disposal, who invite the people to sit down and - trusting Jesus' word of - distribute the loaves and fishes that feed the crowd. This tells us that in the Church, but also in society, a keyword that we need not fear is 'solidarity', that is, knowing how to place what we have at God's disposal, our humble abilities, because only in sharing them, in giving them, that our lives will be fruitful, will bear fruit. Solidarity: a word upon which the spirit of the world looks unkindly!" "Tonight, once again, the Lord gives us the bread which is his body. He makes a gift of himself. We also experiencing "God's solidarity" with humanity, … a solidarity that never ceases to amaze us. God draws near to us. In the sacrifice of the Cross He lowers himself, entering into the darkness of death in order to give us his life, which conquers evil, selfishness, and death. This evening too, Jesus gives himself to us in the Eucharist. He shares our journey, or rather, He becomes food, real food that sustains our lives even at the times when the going is rough, when obstacles slow our steps. In the Eucharist, the Lord makes us follow his path, the path of service, sharing, and giving - and what little we have, what little we are, if shared, becomes wealth, because the power of God, which is love, descends into our poverty to transform it." "Discipleship, communion, and sharing. Let us pray that our participation in the Eucharist may always inspire us: to follow the Lord every day, to be instruments of communion, to share what we are with Him and with our neighbor. Then our lives will be truly fruitful." In the Eucharistic bread we receive the inexhaustible multiplication of the bread of Christ's love, rich enough to satisfy the hunger of every age and thus seeking to place us, too, at the service of the same multiplication. The few little wheaten breads of our lives may seem without value but our Lord needs them and asks for them. The Church's sacraments are, like the Church herself, fruits of the grain of wheat that dies (Jn 12,24). To receive them we have to enter into the movement from which they themselves come. This movement consists in losing ourselves, without which we cannot find ourselves: "Whoever wishes to save his life will lose it; but whoever loses his life for my sake and that of the Gospel will save it" (Mk 8,35). These words of our Lord are the basic formula for a Christian life...; the characteristic shape of Christian life comes from the cross. Christian openness to the world, which is so often preached today, can only find its true model in the open side of the Lord (Jn 19,34), the expression of that radical love that is alone able to save. From the pierced side of Jesus crucified blood and water flowed. What is, at first sight, a sign of his death, sign of his utmost failure, constitutes at the same time a new beginning: the Crucified One rises and dies no more. From the pit of death the promise of eternal life arises. Above the cross of Jesus Christ there already shines the victorious brightness of Easter morning. And that is why, to live with him beneath the sign of the cross is synonymous with living beneath the promise of paschal joy. When you think about St. Thomas, what is the first thing that comes to our mind? Yes, "doubting Thomas." Some even go to the extent saying that St. Thomas Christians are all skeptical and we inherited it from our Guardian Apostle St. Thomas who travelled all the way from Jerusalem to Kerala to spread the word of Christianity in Malankara. Now there are many Westerners who doubt that story and claim it is a myth. But evidence after evidence shows that St. Thomas, in fact, was in Kerala. The article goes in depth about Paula discovering 4 Raktha velli (blood silver) coins in Kerala. The coins are so called because some people believe that they came from the same coin lot that Judas received for betraying or "selling" Jesus. (In bible, the 40 coins are described as blood money.) In any case, it is from that period and the appearance in Kerala of those coins further strengthens our faith that St. Thomas indeed came to Kerala. Paula had sent photographs of the coins; unfortunately we lost them due to a computer virus. We will be publishing them very soon after obtaining a fresh set of pictures. 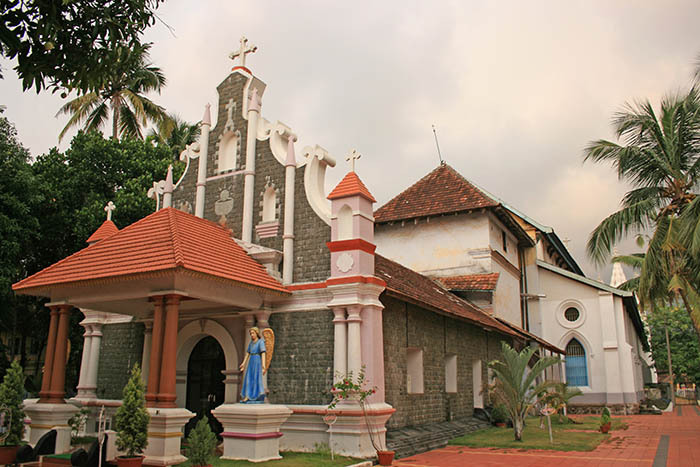 I have also visited St. Thomas Kottakavu Church, North Parur, one of the churches established by St. Thomas in AD 52. The church has gone through renovations and was rebuilt several times. 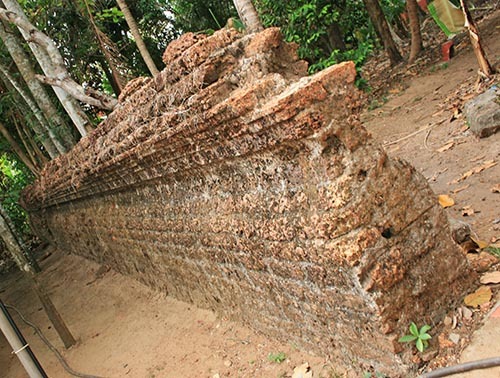 In Kerala, we are not very good in preserving historical artifacts. But a visit to the church still allowed me to see some very old artifacts. with assistance from Adv. Benoy Abraham Erali, Retired Director of Prosecutorial Services, Kerala. Coming back to St. Thomas, I am certainly of the opinion that he got a raw end of the stick with the historical depiction of him as 'the Doubting Thomas.' For one thing, I would rather question to see if I can learn something more. (After all, our Lord told us, "Ask, you shall receive." or the corollary, "Don't ask and you will not know.") I see lot of people who keep quiet in meetings during Q&A sessions, not because they understood everything that was told, but because they feel they will reveal their ignorance to others by asking questions. Let's think about St. Thomas for a moment. What else do we know about him? There isn't much given about St. Thomas in the gospels. The first mention of him is when his name appears in the lists of disciples. There are only three other instances where St. Thomas is identified by name in New Testament, both in the Gospel of John. What a courageous and trustworthy disciple. Jesus said that there is no better love than being willing to die for a friend. This is a Thomas of courage and conviction. St. Thomas appears again in John 14. This is more like the Thomas we know, the questioning one. Jesus is telling the disciples that he is going to prepare a place for them in his Father's house and that they already know the way. Now we come to the passage that gave the bad name for St. Thomas - John 20:19-29. The disciples are hiding from Jews - afraid of their lives. They are a very discouraged group of people who lost their leader. Perhaps they were also short on food and supplies. Most probably the only one who had guts to go to the market and fetch the supplies was Thomas and he volunteered to go. While Thomas was away, Jesus appears to the 10 disciples. Think about this situation for a moment. To put that in context, let me recall a recent incident. Recently Pope Francis called a person, who was going through a major tragedy, by phone without any forewarning. (The picked the phone and dialed the number rather than having his secretary calling ahead of time and introducing him before the Pope spoke.) When the guy answered the phone, and the pope said, "Hi, This is Pope Francis." The guy replied, "Yes, Pope Francis, this is President Obama here." I think Thomas thought that the other disciples were trying to pull a joke on him by saying that Jesus was there. Jesus was crucified and was buried 3 days ago. Was St. Thomas really unreasonable? Like the person who didn't believe when Pope Francis unexpectedly calls, Thomas was just providing an apt response to someone he thought was pulling his leg. That is a normal response of anyone. It has nothing to do with faith or belief. "From the very beginning, the resurrection of Jesus was met by doubt and disbelief. To the Jews of Biblical Jerusalem, it was simply blasphemous for the renegade Christians to claim that a crucified criminal was the Messiah. To the cultivated Greeks, who believed in the soul's immortality, the very idea of a resurrected body was repugnant. Even among Gnostic Christians of the second century, the preferred view was that Jesus was an immortal spirit who merely discarded his mortal cloak. And yet, if the New Testament is to be believed, it was the appearance of the resurrected Christ that lit the flame of Christian faith, and the power of the Holy Spirit that fired a motley band of fearful disciples to proclaim the Risen Jesus throughout the Greco-Roman world. According to the late German Marxist philosopher, Ernst Bloch (says Newsweek), 'It wasn't the morality of the Sermon on the Mount which enabled Christianity to conquer Roman paganism, but the belief that Jesus had been raised from the dead.' "
- Newsweek, April 8, 1996. With the evidence literally at hand, he (Thomas) did not simply say, "He is risen indeed!" but rather, he said, "My Lord and my God!" (John 20:28 NRSV). That's more than a simple, "Gee, guys, you're right! He's alive." That's a statement of belief far beyond simply not doubting what the other disciples had said. "My Lord and my God" is a faith statement of the first order. A belief statement far beyond bickering over biblical facts. The United Bible Societies' handbook on John's Gospel, written to aid those who translate the Bible into other languages, may be helpful in this regard. It says of Thomas' words, "My Lord and my God": "In certain languages one cannot possess such terms as 'Lord' or 'God.' If so, it may be necessary to translate 'you are the one who rules over me, and you are the one whom I worship.' " [Barclay M. Newman and Eugene A. Nida, A Handbook on The Gospel of John, UBS Handbook Series, (New York: United Bible Societies, 1980), p. 619.] That's what Thomas meant. In the Greek text of our New Testament Thomas calls Jesus "The Lord of me and the God of me. "[The Zondervan Parallel New Testament in Greek and English (Grand Rapids, Michigan: Zondervan Bible Publishers, 1980), p. 339.] My Lord! My God! I believe! That's more than Thomas could have come up with on his own. More than anyone was asking him to believe. And certainly more than the evidence could "prove." Even a dead man walking could only point in that direction. Like we stated many times before, God chooses ordinary people to do extraordinary tasks for Him. Perhaps, He wants us to feel comfortable that we can also do great things for God when we surrender to him. St. Thomas, our guardian apostle, certainly was a giant who voluntarily undertook dangerous missions and had no doubt that Jesus was 'his Lord and God.' St. Thomas was not a 'Doubting Thomas'; he was the "Believing Thomas." We can be absolutely proud of our Guardian Apostle. Do you believe in miracles? Do you believe in honest-to-goodness, old-fashioned acts of God? That's a good question to ask on Easter Sunday. Most of us, I suppose, would immediately answer, "Yes, I believe in miracles." And I would say the same. If I were to ask you how many miracles you have ever seen, you would probably say, "Oh, I don't know. I think all of life is a miracle." Or you might say, "I finished my income tax last night and that's a miracle." Both those things are examples of the English word "miracle," but that's not exactly what I mean when I say, "Do you believe in miracles?" I'm not thinking about the surprising events of life or difficult projects finally completed. By "miracle" I mean those contrary-to-human-possibility events that have no natural explanation. "Oh," you say, "That kind of miracle. Sure, I believe in that kind of miracle." But now you are a little more uncertain. By definition, that kind of miracle doesn't happen every day. They happen very rarely, in fact. When they do happen, they are very hard to believe - partly because they don't happen very often and partly because we can't explain them. Even in the Bible that kind of miracle is not an everyday occurrence. The resurrection of Jesus is that kind of miracle. It is totally unexplainable by any human or natural means. That may be why we don't talk about it very much. We're not sure how it happened. The crucifixion we can understand; the resurrection is another matter. Here's the proof: Lots of people wear silver crosses around their necks. You don't see many people wearing little silver empty tombs. So I ask the question again: Do you believe in miracles? Especially this, do you believe in the greatest miracle of all - the resurrection of Jesus Christ? In case you think you have to answer "Yes" just because you happen to be in church, put your mind at ease. If you answer "No" or "I'm not sure," you are in good company. There are lots of people today who aren't sure whether they believe it or not. And there were lots of people on the first Easter Sunday who weren't sure either. Folks like Peter, James, John, Matthew, Bartholomew, Simon the Zealot, and a man whose name has become synonymous with doubt - Thomas. Doubting Thomas. In this message I want to take a closer look at Thomas because I think he's gotten a bit of a bum rap. As I study his story, his doubt seems very understandable to me. I think a consideration of all the evidence will help us see him in a different light. A. He was a twin. The Bible doesn't tell us much about Thomas. We don't know anything about where he comes from or what he did before becoming a disciple. We do have a little clue about his family. When you read about Thomas, he is usually introduced this way - "Thomas who was called Didymus." Now that doesn't mean anything to us, but the original readers recognized it immediately. The name "Thomas" comes from the Aramaic word for "twin." And Didymus is the Greek word for "twin." Thomas had a twin brother or sister, and "Twin" was his nickname. In the early church there was quite a bit of speculation about who the other twin might be. Some have suggested Matthew, but no one knows for sure. B. He possessed enormous courage. It's unfortunate that Thomas is remembered solely in a negative light. There is more to this man than doubt. He first steps onto the stage of biblical history in John 11. Lazarus has died in Bethany - a suburb of Jerusalem. Jesus and the disciples are in the area of Jericho when they get the word. When Jesus decides to go to Bethany, his disciples remind him that the last time he went near Jerusalem, the leaders tried to stone him to death. It would be suicidal to go back. Jesus decides to go anyway. But the disciples were unconvinced. At that point, Thomas speaks up and says, "Let us go also, that we may die with him" (John 11:16). It is a brief statement that reveals enormous courage. Thomas agreed that the Jewish leaders would probably kill Jesus if he went back to Jerusalem. Events would soon prove him correct. But what can you say about a man who says, "If they kill him, they'll have to kill me too?" It takes a real man to say that. There is love there, and loyalty, and despair, and sacrifice, and total commitment. It may just be that Thomas understood better than any other disciple what was about to happen. And that brave statement - if you think about it - may explain his later doubts. C. He did not accept easy answers. Do not let your hearts be troubled. Trust in God; trust also in me. In my Father's house are many rooms; if it were not so, I would have told you. I am going there to prepare a place for you. And if I go and prepare a place for you, I will come back and take you to be with me that you also may be where I am. You know the way to the place I am going (John 14:1-4). Thomas has been listening quietly, intently, carefully. All this talk of coming and going is too much for him. It seems vague and mysterious. In a moment of great honesty he blurts out, "Lord, we don't know where you are going, so how can we know the way?" (John 14:5). Those are the words of a totally honest man. The rest of the disciples were just as perplexed, but only Thomas dared to speak out. We all know people like that - if they don't understand, they won't let it pass. They keep asking until it makes sense. That's Thomas. And that's a second key to his personality. He was an independent thinker, a thoughtful man, not easily stampeded. He wouldn't make a confession of faith unless he deeply believed it to be true. Let others have a glib, easy faith that comes without reflection and deep thought. Not Thomas. His was a faith won through the agony of personal struggle. D. He was fully devoted to Jesus Christ. So the picture we have of Thomas on the eve of the crucifixion is this: He is a brave man, intensely loyal and deeply committed to Jesus. If need be, he is ready to lay down his own life. He is no doubt inclined to look somewhat on the dark side of life. He is completely honest about his doubts, confusion and fears. And he won't be satisfied with second-hand answers. Thus the stage is set for the greatest crisis of his life. We tend to forget what it was like on that first Easter morning. It is worth asking ourselves: If we had been there, would we have believed or would we have doubted? Or to put the question another way, what would it take to convince you that someone you loved had come back to life after being dead three days? Suppose it was a close friend or family member and you saw them die? What would it take to convince you? Or is there any way you could be convinced? Rising from the dead is not a common thing. At best, it hasn't happened for centuries. If we had been there in Jerusalem with Matthew, James and John, would we have believed those strange rumors that Sunday morning? In answering that question, it helps to remember how those who knew Jesus best reacted to news of his resurrection. A. None of the disciples believed at first. Very simply, they were not expecting a resurrection. Now it's true that Jesus had predicted that he would be put to death and then raised to life. But his followers did not understand it. A resurrection was the farthest thing from their minds. Forget his predictions. Forget all that brave talk. They had given up. Who really expected a resurrection on that Sunday morning? Not the disciples. It was the Jewish leaders who persuaded the Romans to seal the tomb. The enemies of Jesus feared something might happen. His friends weren't expecting anything. Mark 16 says that the women who came to his tomb on Sunday morning came to anoint his body. That was part of the embalming process. In the confusion of trying to get the body in the tomb before sundown on Friday, spices had been placed on Jesus' body, but not the ointment. The women came to finish embalming his body. What did they find when they got there? The stone rolled away and an empty tomb. All four gospels agree on this fact. The women did not have the slightest idea what had happened. They weren't looking for a resurrection. Mark says that even after the angel explained what had happened, they fled from the tomb trembling and afraid (Mark 16:8). John says that even Mary thought someone had stolen the body (John 20:2). Luke adds that when the women came and told the apostles what the angel had said, "They did not believe the women, because their words seemed to them like nonsense" (Luke 24:11). Nonsense. Of course. No one rises from the dead. Not after three days. Not after being scourged. Not after hanging on a cross for six hours. Not after having a sword thrust in his side. Not after being covered with 100 pounds of spices and wrapped in a burial cloth. Not after being sealed in a tomb. No, the odds are against it. It was impossible. He was a nice man. He meant well. We all loved him. We walked with him as he told those wonderful stories. And, oh, the miracles he did. We laughed when he told off the Pharisees. How about that time when he did that miracle with the fishes and the loaves? We thought that was great. Sure, he said he would rise again. We all believed it. He even believed it. He had never been wrong before. Why not? He saidIndependence Day was the Son of God. We're sure going to miss him. Wouldn't it have been great if he had pulled it off? Nobody would believe it. What a party we'd have. And Mark says, "When they heard Jesus was alive … they did not believe it" (Mark 16:11). Who could blame them? If you had been there, would you have believed it? B. Thomas was not present. John tells us that Thomas was not present on that Sunday evening when Jesus suddenly appeared in their midst (John 20:19-25). The Bible doesn't say why, but I think I know. There are basically two different ways people respond to sorrow and tragedy. Some seek solace in the company of their friends. They want people around to help them talk it out. Others prefer to be alone with their thoughts. Such was Thomas. If it is true that Thomas realized more than the others what was going to happen in Jerusalem, then it may also be true that he was more deeply hurt. He was not with the disciples because his heart had been crushed. Everything he had, he had given to Jesus, and Jesus had died. He still loves, still cares, still wants to believe, but his heart is broken. He is not a bad man nor is his doubt sinful. Deep inside he wants to believe. Don't put him down too hard. We've all been in the same place. If you wish to call Thomas a doubter, please do not make him out an unbeliever. Some have tried to place him in the company of the skeptics. He does not belong there. Thomas is definitely not a skeptic or a rationalist. His doubts come from devotion to Christ. There is no doubt like the doubt of a broken heart. It's one thing to doubt the Virgin Birth in a classroom setting. It is something else again to lose someone you love and wonder if there is still a God in heaven. A. Thomas was not a skeptic. There are two kinds of doubters in the realm of spiritual truth. There are those hard-boiled rationalists who say, "I don't believe it and there's nothing that will make me believe it." Such people enjoy their doubt, talk about it, laugh about it, and get angry when they are refuted. A person like that is not looking for answers; he's looking for an argument. He counts the difficulties, seizes objections, and looks for loopholes. The Pharisees fall into that category. When they asked Jesus for a sign, he refused, calling them "an evil and adulterous generation" (Matthew 16:1-4). B. His doubt sprang from a broken heart. But there is another kind of doubter, the person who says, "I don't believe but I'm willing to believe if I can see for myself." Thomas fits this category. He is not an unbelieving skeptic; he is a wounded believer. Remember, Thomas didn't doubt the miraculous in general. He had seen many of Jesus' greatest miracles. But this one was too big to take someone else's word for it. He had to see it to believe it. And who could blame him? C. He was not unwilling to believe but unable. No one wanted to believe more than Thomas. But he had seen too much, he knew too much; all the facts pointed in one direction. Before Thomas would believe he had to personally see Jesus. And he had to be sure it was Jesus - not some dream or vision. He had to be sure it was the same Jesus he saw die. That's why he couldn't just take the word of the disciples. Not on something like this. He was not unwilling to believe, but unable. Some people are satisfied with the testimony of others. Some are not. Thomas was not. Did he doubt the truthfulness of the others? No, he knew they believed they had seen Jesus. But that wasn't enough. Lots of people think they see things. Thomas couldn't get rid of the suspicion that they had seen a ghost. He could not live with a second-hand faith. He had to see for himself. When he says, "Unless I touch his wounds, I will not believe," there is much more than doubt. There is love, and sorrow, and pain, and a tiny grain of hope. Thomas stands for all time as the one man who most desperately wanted to believe if only he could be sure. Can you blame him? Would you have been any different? A. Jesus invited Thomas to see for himself. After all these years, Thomas has gotten a bad reputation. Doubting Thomas, we call him. We tend to look down on him. But not Jesus. Eight days later Jesus appeared to the disciples a second time. This time Thomas was with them. Jesus speaks to him as to one whose faith is weak, not to one who has an evil heart. He said, "Put your finger here; see my hands. Reach out your hand and put it into my side. Stop doubting and believe" (John 20:27). It's worth noting that Jesus knew all about Thomas' doubts. He knew the raging sea within his heart. And he came just so Thomas could be sure. Jesus didn't put him down. He said, "Go ahead, all you who wonder if it is true. See for yourself. Stop doubting and believe." Here is the wonderful truth: Doubters are welcome at the empty tomb. Do you believe in miracles? Do you believe in the miracle we celebrate on Easter? If you answer "No" or "I'm not sure," then welcome. It's okay to be an honest doubter. If you came that way and want to leave that way, it's okay. When you're ready, he'll be there waiting for you. Sometimes we act as if all doubt is sinful and that people with doubts are not welcome in church. And sometimes we try to pretend that Christians have everything sewn up, all questions answered, and that we never have doubts. That attitude is both sad and wrong. We all have our doubts and most of us would be healthier if we admitted that fact. Our Lord welcomes every sincere person and invites the doubters to check out the evidence for themselves. This story also teaches us that Christianity is based on verifiable evidence. Christ never asks us to believe for no reason at all. He told Thomas to check out the evidence and come to his own conclusion. He makes the same invitation to you and to me. Ours is a skeptical, jaded generation that has learned to question everything. We've been lied to by people in authority and misled so often by the media and by Hollywood that we automatically doubt any claims to absolute truth. When Christians declare that Christ is risen from the dead, we shouldn't be surprised when someone says, "Oh yeah? I saw that on the David Copperfield special the other night." Over the centuries unbelievers have propounded many theories to explain away the bodily resurrection of Jesus: That Jesus didn't really die, he just passed out and revived in the tomb; That the women went to the wrong tomb; That someone stole the body - the Romans, the Jews, the disciples; That Jesus somehow faked his own death and then pretended to come back from the dead; That the disciples had a mass hallucination and imagined that Jesus rose from the dead; That Jesus rose spiritually while his body remained in the tomb; That the early church concocted the whole story. Even today there are those who still cling to these outmoded, discredited ideas. We say to everyone what Jesus said to Thomas: "Come and see for yourself. Check out the evidence. Read the story with an open heart and an open mind. Stop doubting and believe." We believe that when all the evidence has been fairly evaluated, the only possible conclusion will be that on Good Friday Jesus died and was buried and on Easter Sunday morning he rose from the dead. The entire Christian faith hangs on this one fact: Jesus rose from the dead - literally, physically, bodily, visibly. During the turbulent days following the French Revolution, a man decided to start his own religion but found that he had difficulty attracting new converts. When he asked for advice, a friend told him this: "To ensure success for your new religion, all you need to do is have yourself crucified and then rise from the dead on the third day." His religion disappeared because he was unable to follow that advice. Jesus is the only person in history who has ever met that qualification. B. The strongest doubters often become the strongest believers. Doubt does have its uses. Deep doubt is often the prelude to an even deeper faith. I love the way Frederick Buechner expresses it: "Whether your faith is that there is a God or that there is not a God, if you don't have any doubts you are either kidding yourself or asleep. Doubts are the ants in the pants of faith. They keep it awake and moving" (from the book Wishful Thinking). It is a wonderful truth that the greatest doubters often become the strongest believers. And the honest doubts - once resolved - often become the bedrock of an unshakeable faith. It has been said that no truth is so strongly believed as that which you once doubted. In the history of the Christian church, the greatest doubters have often become the strongest believers. That's why the story of Thomas is in the Bible - so that honest doubters might be encouraged to bring their honest doubts to the empty tomb. Thomas did, and his doubts were washed away by the person of Jesus Christ - alive from the dead. C. Blessings come to those who believe what God has said. All that God asks is that men be consistent with themselves. He asks that you give this story the same treatment you give to any other story. Sift the evidence, judge the record and come to a conclusion. It's all right to doubt, but don't let your doubts keep you away. Come to the empty tomb and see for yourself. When Thomas saw Jesus, he fell at his feet and exclaimed, "My Lord and my God" (John 20:28). That stands as the greatest testimony given by any of the apostles. It is the climax of John's gospel. And it comes from the man who had the strongest doubts. Where do we fit in? After all, Jesus has gone back to heaven. We don't have the same opportunity Thomas had of seeing the Lord Jesus face to face. What do we do with our doubts? Jesus has a word for us too. "Blessed are those who have not seen and yet have believed" (John 20:29). There are those who say that the resurrection of Christ is not important, that what matters is that Jesus lives in our hearts. But if Jesus is still in the tomb, he is not living in our hearts. "If Christ has not been raised, your faith is futile; you are still in your sins" (I Corinthians 15:17). Too many people, including some Christians, approach faith like the boy who said, "Faith is believing what you know is not true." Wrong! Our faith is founded on the facts of history. If any atheist or Buddhist or Hindu or materialist or Muslim or anyone else had been standing in that same room, he would have seen what Thomas saw. He would have seen Jesus because Jesus Christ was really there - alive from the dead. If we had been there, we could have touched his scars with our own hands. We are not there, we are here, 2,000 years have passed, and Jesus promises a special blessing to those who of us who believe without seeing. If you are waiting for some sort of mathematical proof that Jesus rose from the dead, I can't give it to you. But the historical record is there for everyone to examine. It contains abundant evidence for those who choose to believe, and people who decide not to believe can always find reasons not to believe. D. Don't let your doubts keep you from Jesus. No one can remain neutral forever. You can bring your doubts to the empty tomb, but you have to make a choice. You cannot stay on the fence forever. Either you believe or you don't. This is Easter Sunday. It's a wonderful day to make that choice. It's a great day to stop doubting and start believing. You know that Jesus died. There is no doubt about that. You know he died for you. You know he rose from the dead. The question God is asking you is, "What have you done with my Son?" Jesus said, "Stop doubting and believe." Father, we thank you for the beauty of Easter. We thank you that the deepest questions of life are answered with the simplicity of an empty tomb. Lead us into the garden of the Resurrection where we may meet our risen Lord. May we never live again as if Jesus were dead. May those who doubt come to saving faith and find life through his name. In the name of Jesus who died and rose again, and who lives forevermore. Amen. I believe your website was among the first ones to carry my story of St. Thomas and the Four Silver Coins back in May 2007. It is 8 years since, that I am writing once again with the help of my good Indian Catholic friend Justin who is translating my German into English. For the record, here is the full story of the events that led me into publishing the discovery of those four coins. To understand the background information for this article, we strongly urge you to read that article. Paula Gruber had sent the photographs of the coins. Unfortunately due to a virus problem in the computer, we lost those photos and will publish them soon. We are sorry that the photos are not included here. It was actually on my initial visit to India in 1972 that I first saw the four Rakta Velli [blood-silver] pieces. I visited the Nair Tharavad (ancestral home) at Cheru Kunnu in Cannanore district along with a mutual acquaintance, a nun from the nearby St. Martin de Porres Hospital who was also my interpreter. (My travel out of Germany was prompted by the state of my mind. I remember I was very depressed that year following the massacre of Olympic athletes in the city and later the passing away of my mother.) Anyway, on that occasion, the story that Parukutty Amma, the old lady at the Nair Tharavad in Kerala, told me seemed ludicrous and farfetched. 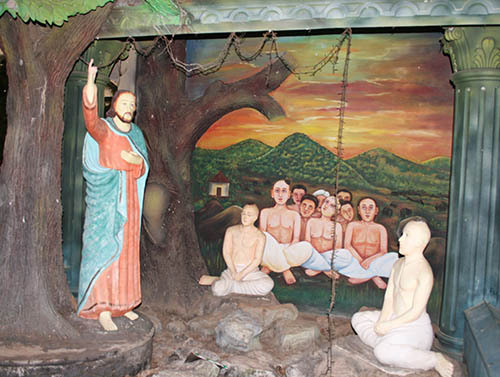 But the faulty perception was partially mine as I had never really believed the story that the apostle St. Thomas had visited as far east as India or even that Christians actually existed in India as early as the first century AD. Thanks to my ignorance, at first it sounded nonsensical because I reasoned that neither the Romans nor, for that matter, any substantial community even within Judea had converted to Christianity as early as that. They would probably still be recovering from the shock of the crucifixion. To be told that a contemporary of Christ himself had established many churches in Kerala about 1,950 years ago was, I then thought, a local yarn or legend. As many Europeans still do, I believed the propagation and the spread of Christianity in India was a result of the much more recent colonization of India by Europeans such as the English, French, Dutch and Portuguese despite the nun from the local mission hospital making several attempts to convince me that I was wrong. In fact, on that visit to Parukutty's ancestral household I had not even bothered to photograph, measure or weigh these venerable coins when they were shown to me. But by the year 1976, sitting in my room in Munich, I had begun to give a more serious thought to what exactly I had been shown at Parukutty's ancestral house four years ago. My curiosity had reached a highpoint for I had just returned from Lisbon where I had the opportunity to go through a private collection of very old manuscripts dated between 1690 AD and 1860 AD, recovered or rescued from Daman and Goa, India, in 1961 by one Manuel António Vassalo e Silva, which contained details of several attempts by the Portuguese to acquire four silver coins, referred to variously as moedas de prata santos, moedas de Tomas, relíquias de Tomas and moedas sangrentos supposedly in the possession of some Hindu family in Malabar. There were details of arrests made, interrogations carried out and even summary executions. It is also mentioned in a Padroado Real, indicating that even the Pope of that time was aware of the existence of these coins. Now there was no doubt in my mind as to what the Portuguese were looking for. I longed to return to Kerala once again and visit Cheru Kunnu. Thus in the winter of 1976 I landed at Bombay, into a very different India from my last visit. It was as if some of Germany's afflictions had followed me there. The whole country was in some sort of curfew and my passport and travel papers were being scrutinized more often and in greater detail. The police were present in most places. I remember being warned by well-wishers not to be critical of the government or be seen carrying more cash than a regular tourist. A large number of the country's opposition as well as press reporters and foreigners were languishing in jails. The vibrant democracy I had known of that country seemed to have gone bananas! However, I had no intention of abandoning my quest. 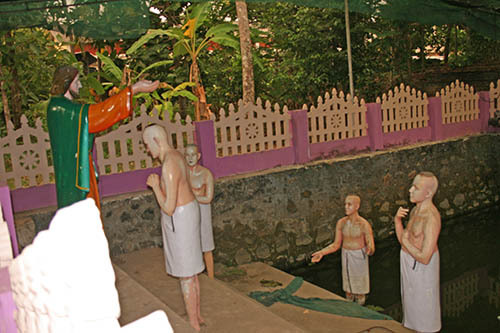 In the very first week of that visit, I had not only come to know the story of St. Thomas and his martyrdom in India, near Madras, but also that in the past, various denomination of Christians in Kerala had made attempts to acquire the four coins gifted by St. Thomas to preserve them in a church as relics. I was told by some old priests of a Catholic Church that Syrian Christians (or Nasrani Christians) made the most vociferous claims to the coins as early as the 1920s but that the issue took a back seat during the Malabar riots of 1921 and the matter was subsequently forgotten. According to my friend at the mission hospital, Malayalam writings of that time made several mention of the St. Thomas coins. 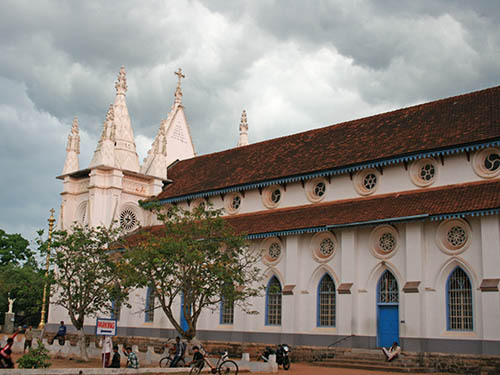 Nehru, during his time as the Prime Minister of India, is believed to have received a petition from a priest of Kerala to do all that he could to "restore" the coins to the Nasrani church. Nehru apparently ignored the petition as his office issued no reply. On my second visit in the winter of 1976 I found myself in a different scenario at Cheru Kunnu. The beautiful ancestral house with its kolum (pool), teak-wood pillars and central courtyard was lying in a huge heap of rubble. The heavy brass fittings on the doors were being ripped off, the age-old timber to be sold away. The rubble was now being used to fill the black granite-lined kolum on the steps of which Parukutty and I had sat chatting not many years ago. Trucks arrived to carry the timber and age old furniture away. I was aghast and remember shedding a few tears, much to the amusement of some family members and workers scattered around the compound. A foreigner is hardly ever seen in these parts and this time, my friend - the nun from the mission hospital - could not accompany me either. I stood alone at the edge of the compound at the concrete gateway of the house the locals call a koni, having made it through the pathways in the paddy fields below and terrified at the thought of encountering a snake. A smaller house of common contemporary architecture had been built nearby, through the doorway of which Parukutty emerged. She smiled despite looking much older than her seventy-odd years and very weary. She was obviously ailing and had only risen from her bed on hearing of my arrival. She offered me some prasadam from the Someswari Temple, a languishing ancient Hindu shrine located barely a minute's walk away outside the Tharavad compound. I was then met by a nephew of Parukutty who was a government revenue officer of some seniority in the district collector's office. He explained in slow and halting English how difficult it was today to maintain a manor house of that size "in this day and age." And how and why everybody in the family was now living scattered elsewhere, mostly outside the state of Kerala prompting him to make the decision, on behalf of the whole family, to divide the large estate into plots for the heirs of the tharavad if they ever chose to come back to the land. He also revealed that the tharavad house they were now demolishing and which was at the foot of a gradually rising hill, was a rebuilt one, the original one having been removed to allow the railway line to pass through in the early 1900s. I followed Parukutty into her new house, recently built on what was given to her as her share of the tharavad land within the large compound. Over coffee, cakes and banana chips I broached my pet topic again with her. The joy and the enthusiasm of my earlier encounter with her was missing and it took some effort to keep her on the topic. She complained about the power-cuts and the disinterest of most family members to visit the tharavad even once in a few years which had resulted in the decision to demolish the tharavad. 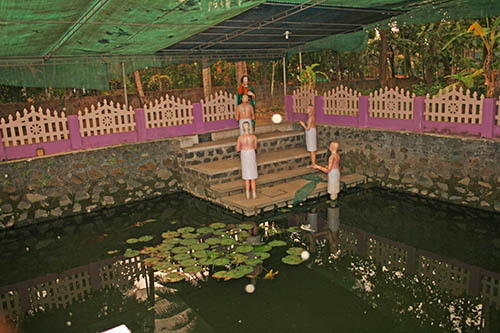 She vaguely remembered the tharavad in all its splendor when she was a little child. She recalled all the lawyers, judges and soldiers in her family, the temple elephants and palanquins, festivals and feasts; and especially of the family's contribution to the nearby Annapoorneshwari Temple as well as the austerities endured during the country's freedom struggle of 1947. She remembered, as a child, learning the spinning of cotton on a charka (spinning wheel) from the elders as one of Mahatma Gandhi's efforts at self-sustenance. "Today, our clothes come from Dubai" she laughed. On my request, and when the table was cleared, the old lady produced the little box with the coins. My excitement this time was irrepressible. I washed my hands before handling them and took pictures of each as best as I could. Using a small weighing scale I carried for the purpose, I weighed each piece of silver. I even measured the approximate diameter of each coin. Satisfied that at last I had enough data, I returned the coins to the old lady. She then began to narrate three or four instances when the nun from the mission hospital brought Christian patients with acute and chronic ailments furtively to the tharavad to pray before the coins, placing their hands over the little box that contained them. The nun claimed that the patients experienced quick and complete recovery from their afflictions. I listened to the familiar miracle stories related to Christian relics the world over, wondering what to make of it. All went well up to that point in time. However, from that moment onwards, other relatives who had been curiously listening to our conversation began addressing Parukutty in Malayalam, after which the mood in the room turned altogether somber. Parukutty suddenly pleaded with me not to write or publish any article regarding the coins as the country was under martial law of some kind. She tried to explain to me that any controversy related to the coins in the newspapers may be met with unwarranted police enquiry, something her relatives feared. Though I couldn't see any crime committed or law broken by the mere possession of some family heirloom, I promised her I would publish nothing. As I was returning to Bombay, I also remember that year the newspapers in Kerala was agog with news of some human rights issue surrounding police brutality referred to as the "Rajan case." Perhaps there was this unreasonable and morbid fear of what the police might be capable of in the psyche of a Malayalee in those days. Several years would pass before I travelled to Israel in the mid 1990s and was introduced to an expert in middle-eastern, especially Biblical numismatics. His name was Ya'akov Meshorer, an acclaimed scholar in the field. He examined the enlarged photographs of the four Rakta Velli pieces closely along with the weights and diameters I had recorded. "Interesting! Remarkably well preserved!" Meshorer remarked. "The lack of adequate patina for a set of coins as ancient as these would have bothered me. But considering they remained uncirculated and did not change hands could be partly the reason for their mint condition. But these four coins fall in the category of what I call ‘Jerusalem fakes'." "Meaning they are not the real thing?" I enquired. To which Meshorer explained, "I do not wish to comment on whether these four coins belong to the thirty pieces mentioned in the Judas story as told in the New Testament. But my belief is that it was most likely a Shekel of Tyre that Jesus and Peter paid as the Temple Tax. Half Shekel each as mentioned in Matthew 17:27, and therefore it is possible that the same Shekels of Tyre were the coins that the priests of the temple paid to Judas as mentioned in Matthew 26:15. There were two kinds of Shekels from Tyre in use in Judea at that time. One that had the alphabets KP inscribed on them belonging to the era 18 BCE - 66 CE and one without. When Tyre discontinued minting these coins in 19 BCE, and Jewish authorities continued minting them in Jerusalem because they were the only coins acceptable for tax payments, perhaps due to the higher percentage of Tyrian silver in these coins. The artistic style deteriorated however with every new lot minted over the decades, but their overall look as a Tyrian Shekel and their weight in terms of silver content was enough to pass them off as Shekels of Tyre. These temple fakes are many, varying greatly in design accuracy as various casts and molds were used by the priests over time. Many perhaps remain to be discovered yet. Your four coins belong to this category. It may well have been thirty of these Jerusalem fakes that Judas received from the priests. The four coins you have here definitely belong to a category of the Shekels of Tyre that existed at the time of Jesus. That information from a scholar of eminence was enough for me. I knew, for certain, the coins were true relics from St. Thomas. It was anyway inconceivable to me that a semi-literate old Hindu woman would make up such a fantastic story. The old Portuguese records in themselves were quite convincing to the extent that the Portuguese inquisitors had definite intelligence and information that the coins had survived till the 16th and 17th century, and were in the possession of the Kambian Valappil Nair family. The only question that now remained unanswered in my mind was how St. Thomas came into possession of the thirty Shekels of Tyre that was a matter of secret transaction between the temple priests and Judas. As if by an act of destiny, translations of a text called the Gospel of Judas discovered in Egypt began emerging from 2001 and was even published in early 2006 by the National Geographic Society. The Gospel of Judas is a Gnostic gospel whose content consists of conversations between Judas Iscariot and Jesus. In contrast to the canonical gospels which paint Judas as a betrayer of Christ who delivered him up to the authorities for crucifixion in exchange for money, the Gospel of Judas portrays Judas' actions as done in obedience to instructions given by Christ. Even in the canonical gospels there is evidence to believe Jesus knew exactly who would betray him, when and how it will be done, etc.. Obviously there was more to the events of 2000 years ago than was recorded by Mark, Mathew, Luke and John. Of the hundreds of gospels written in the centuries following Christ, only four have been declared "acceptable" or Canonical. There is also a long list of "lost gospels" - which have been well known to have existed and written earlier than the canonical gospels, perhaps immediately after the crucifixion, but which disappeared or have been destroyed at various times in history on the whims of some monarchs, non-Christians or the Catholic Church itself. I am certain the truth will finally emerge on how these thirty pieces of silver came into Jesus' and St. Thomas' possession. Today, I am over seventy years old and quite feeble myself. My last visit to India was in 2004, staying long enough to see the Taj Mahal and visit Rajasthan. I returned to Germany in 2005. It was another India all over again for me. Cars of every description plied the roads. The roads themselves were lined with malls, supermarkets and stores selling exclusive international brands. People looked wealthy and fashionable. Consumerism was certainly at a high. It was mid-October when I landed at Bangalore, this time having decided to take the road to reach Kerala. There was some excitement on the highway when news broke that some famous bandit had been killed by the police. I remember wondering what a strange country I was in. I had just left behind a city whose streets were lined with blue-chip corporates and malls with bowling alleys and fine-dining restaurants. In a matter of less than a couple of hours I was on a highway where a man who lived his life as a forest brigand and elephant poacher had just been killed. My dear Parukutty amma was long dead and the compound in which the tharavad stood was overgrown with weeds. Some new houses in the vicinity were perhaps owned by her relatives but it appeared pointless trying to communicate with them. My friend, the nun at the mission hospital, had also been transferred elsewhere. I had come alone and left Cheru Kunnu in a matter of hours without meeting anyone except some hospital staff who barely knew me. I felt free now to talk about the coins, perhaps even write about it. This is what I did when I returned to Munich. Justin, a contact in India, later wrote to me to tell me that the story was circulated among Indian Christians but most seemed unsure about its authenticity. Very few even felt the need to investigate anything more into the matter. Parukutty was right. Nobody quite cared. A few months later a relative of Parukutty called me on my mobile phone all the way through to Munich, in a rather foul mood, wanting an explanation as to why I had broken my promise. I told him that it was time the world got to know about a very important relic lying in obscure hands. And that anyway the person to whom I had made the promise was long dead. Apart from that I had myself published the article only in Germany. I felt I had done my bit for God and man. The caller began to use abusive language. I listened to some of his offensive expletives and decided I had had enough of this exploit in my life. I am aging too and not in good health lately. I have delved into this story long enough. I have failed to understand the irrational fear of publicity some members of this family have. Apart from the fact that this event in the Bible, particularly that of the exchange of these silver pieces between Judas and the temple priests, was the pivotal episode for the very start of Christianity, these relics also proves that the apostle St. Thomas had indeed visited India. The coins may never be revealed to anyone for another generation by this Hindu family. But I, once and for all desired to set the record straight and let the matter rest for good in my life. Thus, this is my story in all its necessary detail. As much as any of the twelve apostles chosen by Jesus Christ - as much as Peter, as much as Paul - Thomas has captivated the imagination of modern western Christians. They tend to identify with a doubter. They want to know him better. In modern religious art, he is often depicted moving his hand (sometimes tentatively, sometimes boldly) toward the wound in Christ's side. In the far east, however, and especially in India, Thomas has always been revered as the great apostle, the man who did for the orient what Peter and Paul did for the occident. Thomas was a devout Jew who grew up in a unique vassal kingdom within the Roman Empire. There, children and young men learned their trades from their fathers. They learned the law in the synagogue. The rest of the world judged Palestinian Jewish culture to be strange, idiosyncratic, and intractable. Thomas and his countrymen saw it a different way: God had chosen them and given them a way of life that set them apart from other nations. Into Thomas's ordinary life came a rabbi named Jesus, who changed him, changed his life, changed his plans. Thomas experienced many adventures in Jesus' company before traveling - as a rabbi himself - to the distant and exotic land of India, a climate and a culture quite unlike his own. Legend has it that India fell to him by lot when the apostles were allowing God to determine their future. Thomas drew the straw tagged for the very ends of the earth. According to ancient traditions, Thomas voyaged along the trade routes; and, like Paul, he went first to the Jews of his adopted country. Over the course of many years in India, he preached, worked miracles, and inspired conversions, until a fateful final confrontation with the local priests of the goddess Kali. A vibrant, distinctive Christianity grew from his gospel seeds. And the word spread. There is ample testimony from the era of the Fathers confirming Thomas's apostolate in India: the Syriac Acts of Thomas describe it in detail; Clement of Alexandria mentions is, as do The Didascalia Apostolorum, Origen, Eusebius, Arnobius, Ephrem, Gregory Nazianzen, Cyrillonas, Ambrose, Gaudentius, Jerome, Rufinus, Theodoret, Paulinus, Jacob of Sarug, Gregory of Tours, Isidore of Seville, and many others. And Thomas' deeds were never forgotten in India itself, where Christianity has endured in spite of tremendous difficulties. There are pilgrimage sites related to the apostle's life and death - they were popular destinations even in the time of the Fathers - and several epic poems about Thomas have been passed down by Christians for generations. (There are even popular Hindu poems about him!) Curiously, these ancient songs preserve certain tell-tale archaic forms of expression that we find in the Acts of the Apostles - referring to Christianity as "The Way," for example. These, too, could be evidence of great antiquity. Marco Polo heard the oral traditions when he visited India. So did the Portuguese traders who colonized the lands in the fifteenth and sixteenth centuries. They made voluminous records of all they found. The traditions made their way, via missionaries, to the New World. There, the first generation of Aztec and Maya to convert to Christianity read Thomas back into their own history; and legends emerged of the apostle's fabulous voyage to Central America. When those American tribes read the gospels and the histories of the church, they could imagine Thomas, alone of the apostles, coming to them with the good news. Recent bestsellers often present Thomas in terms of so-called "gospels" that bore his name. Those texts are certainly ancient, and they are fascinating in an esoteric way. But they do not even pretend to be historical; nor do they present a character of any human warmth, a Thomas whom readers can come to know. Instead, "Doubting Thomas" appears as a useful peg on which to hang sectarian doctrine. But Thomas was not the sort of seemingly disembodied spirit we encounter in the pseudonymous gospels that borrow his name. He was a particular man of flesh and blood who lived in a particular time and place. He took particular hardships upon his flesh (harsh travel, demanding asceticism, persecution and abuse) and he shed his blood at a particular moment, all for the sake of the saving gospel of Jesus Christ. Pope Paul VI wrote a letter on the 1,900th anniversary of the martyrdom of St. Thomas, in 1972 - an important papal acknowledgment of the Indian tradition. Pope John Paul II also made several references to Thomas' life and death in India. Some critical scholars (of course) dismiss the accounts of Thomas in India. But India's historians have subjected the evidence to rigorous scrutiny in recent years, and even many Hindus have come to affirm its possibility and even probability. I'm definitely with them, and I hope to write a book on the subject in the not too distant future. I invite you to read a couple of books and study the matter for yourself. They're not available in the United States, so you have to order them from India. The books are A.M. Mundadan's 'History of Christianity in India' (Volume 1: From the Beginning up to the Middle of the Sixteenth Century) and George Menachery's massive collection 'The Nazranies'. While you're waiting for your books to arrive, please pray Thomas's intercession for the Christians of India, some of whom have endured subtle (and not so subtle) persecution in recent years. The blood of the apostle is the seed of their Church. We can be certain it will flourish in peace in due season. Oh, and one more thing: St. John's gospel gives us no indication that "doubting" Thomas took Jesus up on the offer to explore the wound in His side. That's an imaginative leap that many artists have been willing to make. But all we know from the New Testament is that Thomas made the leap of faith. 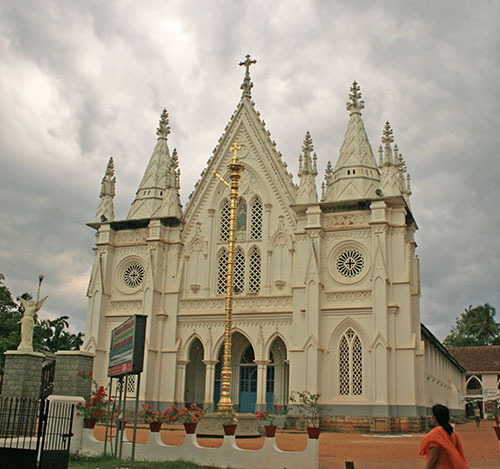 For further information on St. Thomas in India we suggest that you also refer Prof. George Menachery's book, "Kodungallur: City of St. Thomas" alias "Kodungallur: Cradle of Christianity in India." The Bible has its share of heroes, men, and women, larger than life, who inspire with their courage and faith. Moses, Abraham, Mary, the mother of Jesus, the Apostle Paul, Joseph, Esther. King David. Daniel, those three teenagers in the fiery furnace. They are the stars of the Bible. They are not perfect people, mind you, but they have some show-stopping moments. There are the other kinds of stars: rebels, heretics, the problem children of Scripture. These are the ones we remember because they were so very human: Cain, Joseph's brothers, Lot's wife, Samson, Jonah, King Saul, the prodigal son, the rich young ruler, Judas Iscariot. These people are defined by the time they blew it. That brings us to Thomas, the disciple known for his skepticism. "Doubting Thomas" he's been called for centuries, held up in countless sermons as a bad example. But was what Thomas did really all that terrible? Does he deserve his status as the poster child for the cold and faithless? The story begins with some terrified disciples, so much so that they lock all the doors of their meeting house and huddle together, speaking in hushed voices (20:19). What are they so afraid of that first Easter evening? A knock on the door. A swat team from the high priest coming to drag them off to trial. They are afraid they might follow in the footsteps of the now murdered Jesus. That they might be forced to take up their cross after all. But wait a minute, an alert congregation might wonder, didn't the disciples get the news from Mary that Jesus is alive? Why aren't they celebrating? It turns out that Thomas isn't the only one in this story who has to see to believe. Whatever the disciples thought about Mary's report, it didn't make much difference in their behavior. Maybe they thought Mary was hallucinating or confused. Maybe they thought some Romans did steal the body. At any rate, the disciples weren't expecting the Visitor who showed up that night. They certainly weren't expecting him to show up in the way he did. There they are, cross-legged on the floor, their nerves on edge, when suddenly, there he is. Indisputably alive. Indisputably Jesus. He says the one thing they most need to hear: "Peace be with you" (v. 19). And he shows them the evidence: the nail holes, the spear wound. He makes it clear that he is their Jesus. And when the disciples see, they rejoice (v. 20). They forget to keep their voices down, and in the midst of this party, Jesus gives them a mission and a gift. Jesus sends them off and breathes out the Holy Spirit to make them strong and wise (v. 22). What a marvelous night it was. The disciples would never forget it. The disciples that were there, that is. For John is careful to tell us that one disciple was absent that night (v. 24). Brother Thomas missed the whole thing. You can imagine that Thomas was quite bewildered when he did show up at the house some hours later to find the party in full swing. "What is going on here?" Thomas demands, "Have you all gone mad? I could hear you from a block away!" "Relax, Thomas." says Peter. "We have seen the Lord!" But Thomas is unmoved. "Unless I see the mark of the nails in his hands, and put my finger in the mark of the nails and my hand in his side, I will not believe" (v. 25). Now, I don't know about you, but Thomas' objection seems reasonable to me. True, Thomas has been a witness to some incredible happenings in his travels with Jesus: blind ones seeing, lame ones walking, demons fleeing the scene, even a dead man on his feet again. Thomas has seen a lot of miraculous things and believed. But this is different. I would imagine there are lots of Thomases in your congregation, Thomases of all ages. They listen patiently while others talk about what God has done in their lives, but they want to experience transformation themselves, not take someone else's word for it. That is the beauty of a doubting Thomas. A Thomas doesn't take believing lightly. A Thomas knows that if this resurrection business is true, it changes everything. It certainly changed everything for Thomas himself. The story goes that a week went by while Thomas stewed about things. But one week later, Thomas is back in the meeting house with the others. It happens again. Jesus shows up and wishes them peace (v. 26). Jesus turns to Thomas. It must have been quite a moment for him, after all his wrestling, after all his debates. "Touch me if you need to," Jesus says. "Do not doubt but believe" (v. 27). But here's the most surprising thing in this story: When the tangible proof is right there in front of him, Thomas stuffs his hands in his pockets. Could it be he no longer needs it? Instead, he falls at Jesus' feet and cries, "My Lord and my God!" (v. 28) It's one of the clearest confessions of Jesus' identity in the gospels. So why would a man so insistent on having absolute proof end up turning it down? Very strange. But faith is like that. Unpredictable and passionate and free. Perhaps because it is a gift from a God who is unpredictable and passionate and free. Preaching on this story from John's gospel is an excellent opportunity to bless the Thomases in your congregation. To affirm the longing to see and touch Jesus. To praise the fact that they take this whole resurrection thing seriously enough to have some doubts. To recognize that their questioning is itself evidence that God is at work. Bless them in their search for proof until, in God's wisdom, they no longer need it. Do You Celebrate These 6 Freedoms on Independence Day? The Declaration of Independence was adopted by the Continental Congress on July 4, 1776, and announced the separation of the thirteen American colonies from Great Britain. With this, a new nation was formed - the United States of America. History verifies Thomas Jefferson as the composer of the original draft. Once completed, Jefferson submitted his draft to Benjamin Franklin and John Adams for their changes. Eventually, it made its final destination to Congress where it was amended for the last time. Today, we see in its detailed wording why Congress was declaring independence from Great Britain. The most quoted line from the Declaration is "We hold these truths to be self-evident, that all men are created equal, that they are endowed by their Creator with certain unalienable rights, that among these are Life, Liberty and the Pursuit of Happiness." Our forefathers were declaring they not only deserved freedom, but were willing to continue fighting for it. Freedom is a great definition of independence, as it is the result of the choices we make in our life. The power of choice is one of the greatest freedoms we have in our country, and knowing where to find it is important, as we see in Proverbs 2:6: "For the Lord gives wisdom; from his mouth comes knowledge and understanding." 1. The freedom to believe. Our country continues to serve as a magnet for oppressed individuals who come to the USA for an opportunity to capture their dreams. Many dream for a good job, food, and shelter for their family. But our government should not be relied upon as the only resource to replace our faith in a God "who richly provides us with everything for our enjoyment" (1 Timothy 6:17). 2. The freedom to live out our faith. In some countries the mention of serving God or his son means instant death. Our forefathers recognized the creator through their extension of certain God-given rights in the Declaration of Independence. Our faith is the most important of all, as it gives us the foundation and assurance that God is in control of a world in chaos. When life seems out of control, seek the source of all creation — God. He will provide peace in the midst of all your life's storms. 3. The freedom to worship. We are allowed the choice to worship in any way we desire. God created us for fellowship. Our individual gifts are stronger when they are joined with our brothers and sisters in Christ. Sadly, statistics show worship attendance is in a decline as more people choose a life of independence which ultimately leads to a life of solitude. Choose today to ask God to direct you to a community in which to be involved. He will direct you to "give and receive" as needed. 4. The freedom of prayer. Self-reliance is an American lifestyle demanded and respected in numerous circles. Just as this can be seen as a strength, it can also be a tremendous weakness when it leads us to put God on the sidelines of our life, and call upon him only when we need his rescue. In personal times of self-reliance, I sometimes take on an image of seeing myself as "God-like" which results in my placing other gods before him, namely the god of "Me." By choosing to submit our requests to God in prayer we are making the choice to live out the faith to which he calls us. 5. The freedom to vote. In the last Presidential election over 30 million professed Christians did not vote. We must recognize in our nation every vote does count, as issues such as mixed marriage, abortion, social services, and taxes continue to create further divisiveness. Our nation was founded on God, yet we continue to chip away at God’s sovereign place of authority through the decisions continually implemented by the Senate, Congress, and Judicial branches. As a body of believers, we must call sin what it is and stand united as we cast our votes through God’s divine wisdom and direction. 6. The freedom of happiness. If you notice in the Declaration, one of the rights it defines is "the pursuit of happiness." Galatians 5:22 says we can have real joy in our life as we walk in the Holy Spirit. We don't have to pursue happiness; rather we can choose to live it out in the Spirit. This allows us to receive what we richly deserve. So what about the disease, divorce, death and disappointment we may receive along life’s journey? Paul summarizes our responsibility well: "Dear friends, do not be surprised at the fiery ordeal that has come on you to test you as though something strange were happening to you. But rejoice inasmuch as you participate in the sufferings of Christ, so that you may be overjoyed when his glory is revealed" (1 Peter 4:12-13). The fifty-six leaders who signed the Declaration of Independence had the foresight to understand things had to change so the generations who followed them would experience Life, Liberty and Happiness. They accomplished this for all of us to enjoy by having fortitude, a strong vision, and steadfast faith. As we celebrate this July 4th holiday, is it possible for us to have the same impact as our forefathers did for future generations? I believe we can, through the manner in which we act upon the six freedoms listed above. Legacy Planning begins when you realize you will not necessarily complete what you begin in one generation, but rather you become the visionary patriarch or matriarch, understanding the importance of planting strong seeds that may be harvested by many future generations. As we celebrate this holiday, may we plant well so God will provide a bountiful crop which will be enjoyed by many future generations. Guy Hatcher: The Legacy Guy® - is passionate about helping families plan their legacy. His book, 'Your Future Reflection: How to Leave a Legacy Beyond Money', is available at amazon.com. Of course, Yancey would quickly acknowledge that the freedom we enjoy in the West is often taken for granted. In general, we are free to do and to be whatever we want. We move unhindered towards the achievement of our own personal freedoms and objectives, without worrying about impediment or coercive control from outside forces. Certainly, the freedom to move about countries and across state borders effortlessly is a gift enjoyed by many in the Western world. We have the freedom to worship, unhindered by government intervention. Many who have financial abundance are able to access freedoms that only money can buy. We are free to think as we want, speak what we want, and do what we want. In comparison with people in places where freedoms are curtailed, we have the freedom to…. fill in the blank with endless possibilities. But taking an honest look at how freedom is exercised in the Western world means turning a careful ear to this critique from those looking in from the outside. The belief that individual freedom to do, be, or say whatever we want is often cut off and isolated any thoughtfulness towards community consequences or responsibility. Sadly, freedom is rarely viewed as an opportunity to serve others. The apostle Paul raised this issue as he wrote to the early Christians at Corinth. In discussing matters of personal freedom he exhorted these early Christians that "all things are lawful, but not all things are profitable. All things are lawful, but not all things edify. Let no one seek his or her own good, but that of his or her neighbor….whether, then, you eat or drink or whatever you do, do all to the glory of God" (I Corinthians 10:23, 24, 31). In his letter to the Galatian Christians, Paul applies the gift of freedom to a sense of corporate responsibility: "You were called to freedom; only do not turn your freedom into and opportunity for the flesh, but through love serve one another. For the whole Law is fulfilled in one word, in the statement, 'You shall love your neighbor as yourself'" (Galatians 3:13-14). Paul's definition of freedom for love and service seems to fly in the face of understanding freedom as doing whatever one wants to do, individually. And while deploring the restriction or oppression of human freedom as evidenced in totalitarian regimes and systems, might it also be prudent to deplore the unchecked, unthinking, and often self-centered understanding of freedom that occupies many Western societies and systems. We are called to freedom, freedom for others - and not simply as the individualistic pursuit of self-interest. Rightly understood, freedom is grounded in love for the sake of one another. (1) Philip Yancey, "A Living Stream in the Desert" Christianity Today, November 2010, pages 30-34. Source: A Slice of Infinity; Copyright © 2014 Ravi Zacharias International Ministries, All rights reserved.